As adults, we may not be as conscious of our friendships as when we were kids. However, having friends is still extremely important, particularly for support, encouragement and acceptance. There are some people who always seem to have a flock of friends around them, whilst others at the other end of the spectrum keep more to themselves. 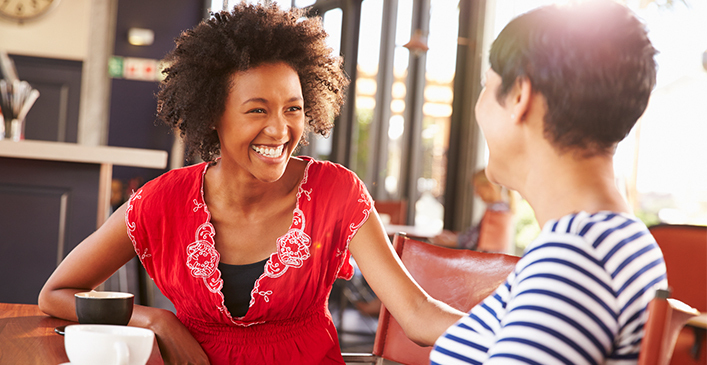 You may currently be in a position of seeking new friendships; whether you are new to an area, have moved on from or outgrown an existing friendship or are just looking to increase your network of friends. But making friends is not always an easy task, especially if you aren’t someone who is naturally social or good at striking up conversations. Here are some ways of breaking out of your comfort zone and making new friends as an adult. A good icebreaker is holding a Coffee Morning. This could also be held to support a charity that you hold close to your heart. An informal Coffee Morning with local people is a great way to find out about shared interests and to wind down in a relaxing environment with people who you are likely to have things in common with. They are extremely popular in the UK at the moment. Whilst there is a downside to social media friendships, and I would never suggest it as a total substitute for “real people,” friends made via social media do have their place in this modern world. This is particularly true if you make friends through forums, as you are likely to meet like-minded people you can chat instantly with, even if they are thousands of miles away. Take an interest in what your potential friend is talking to you about and ask some questions back to keep the conversation flowing. If you do disagree with some comments on a topic, try to avoid showing any anger or aggression in your words. Instead, remain calm, and be kind and tactful with your comments. Personally, I like to post or share mainly uplifting and humorous comments/statements, especially on Facebook as this is a very fun way of encouraging friendly banter! Another way to make friends could be to arrange a social activity with your colleagues after work. This needn’t be anything too heavy; it could simply be a few drinks or a game of bowling, for example. Seeing your colleagues away from their day to day routine is an interesting way of getting to know them properly and a good night out can often lead to fun memories to look back on. If you’re a dog owner, taking him/her for walks is a great way of running into people and chatting naturally to them (as well as great exercise for you both!). Taking your dog to the local park in particular could be a great way of meeting potential friends. If you’re a parent you can join toddler groups as a potential way for both you and your child to make friends. If your kid is of school age, you could invite their best buddy round to play at your house, and also invite their mom or dad for coffee and a chat at the same time. Where possible, try your best to accept invitations to parties and events you get invited to. Even if you aren’t the biggest fan of the person who initially invited you, there is a chance you could bond with their friends or other people that have also been invited. One of the most natural and enjoyable ways of making new friends is to combine it with a hobby of your choice. What you decide to get involved in depends on your personal preferences, but it could range from joining a book club or cooking class to forming or joining a local walking or sports team. People often talk to us when we are out and about without us giving it much thought. The next time someone talks to you in an elevator or at the grocery store, remember they are being pleasant and could even be trying to form a friendship, too. Try your best to continue the conversation as far as possible — you may have more in common than you realized.